When the Horn Dawg founders (Bill and Tracy Walker) moved to Tennessee in 2005 we needed not only an ace trumpet player, but someone who could write and arrange music for the band. Jamie fit the bill perfectly. 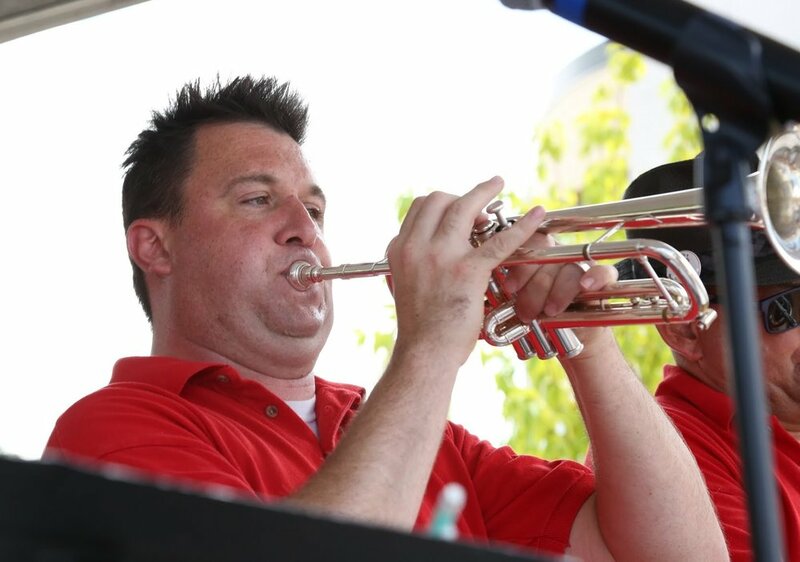 He started out with the 'Dawgs as a substitute trumpet player as early as 2002. He brought in a wealth of experience as both a performer and manager of larger groups of musicians. In addition to his UW Marching Band tenure he also spent four years with the Wisconsin Singers, including stints as the lead trumpet and assistant music director; he was also a part of the a cappella group UW Madhatters. Immediately before jumping onboard with the 'Dawgs Jamie was playing with another Bill Walker creation, Synchronous Soul, playing Original Funk. Jamie provides a strong presence onstage with his playing and has worked his way into the vocals line up with soulful renditions of Signed, Sealed, Delivered and Accidentally In Love. You could say music is Jamie's life. He is a 6th grade band teacher at Waunakee Intermediate School. As one of the band's professionally trained musicians he plays other places than the Dawg Pound. He enjoys performing with the community theater and the ACME Brass Quintet with several other current/former band directors. In the few minutes per week he isn't up to his armpits in musical projects, Jamie is an avid Wisconsin sports fan. Badgers, Brewers, Packers–he might even follow the NBA team in Milwaukee! Now that's dedication to state sports! He lives in Madison with his wife Laura and three children.